Jim Brewer recently shared photos of his latest resin kit builds on the Resin Freight Car Builders discussion list. Here’s Jim with details on his models. I recently completed building two HO scale 40-foot, rebuilt steel boxcars that follow Georgia Railroad prototypes. These are old Sunshine Models kits. Georgia 39441 seen above is kit #64.83 with a diagonal panel roof. The Sunshine Models Prototype Data Sheet, #64E indicated Georgia Railroad, together with Atlanta & West Point and the Western Railway of Alabama rebuilt these cars from Pratt truss boxcars in 1947-48. Georgia 39377 is kit #64.82 and has a straight panel roof. I basically followed the standard assembly for a Sunshine resin kit. In viewing the only photograph of the prototype, I noted the right ladder stile on each ladder extended higher than the left stile, and there were rivets visible on the extended portion. Also, the brake step platform appeared to be held with inverted “L” brackets and not the traditional angle supports below the platform. I used MicroMark rivets on the stiles and inverted “L” brackets. The kits include Plano Apex steel running boards. I must admit that it took me several tries to successfully adhere the latitudinals to the brass frames supplied. Two different sizes of chain were used on the models; 40 links per inch was used between the brake staff and brake housing, while 27 links per inch was used between the brake cylinder and brake rod. The Prototype Data Sheet indicated most of the rebuilt boxcars received Miner power hand brakes so I used a Kadee Miner brake wheel. After completing the build, the models were washed with warm water and detergent, rinsed, and allowed to dry overnight. A primer was applied. For several years I have been using a ready-to-spray lacquer primer by Dupli-Color that I purchased at a local auto parts store. The models were painted with Scalecoat II Boxcar Red, S2013. Once dry, I was able to apply decals without need for a gloss coat. I did seal the decals with a gloss coat, followed by Dullcote. Weathering was done with india ink and shoe dye washes, as well as Pan Pastels. I enjoyed building these cars. I have the Atlanta & West Point and Western Railway of Alabama kits in my stash and hopefully will complete them soon. 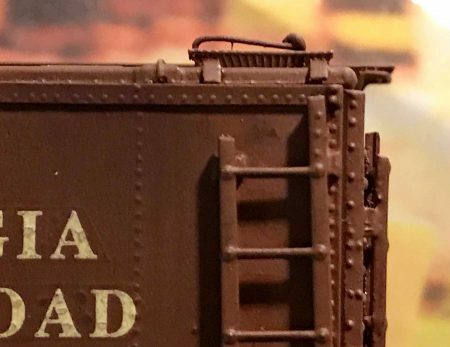 Thanks to Jim Brewer for sharing his work on a pair of classic resin boxcar kits. Questions and comments can be posted below. Please follow the instructions so your comment can be posted. All comments are reviewed and approved before they appear. To subscribe to this blog, enter your info for a comment and check the last box to notify of new posts by email. Share the blog link with other model railroaders. Very informative and inspiring. Tanks for posting. Sonny, the Helpful Links page of this blog has several resource links that may assist with your project. Check out the Resin Freight Car Kit Primer, part 1, for basic construction techniques. I suggest you start by building a boxcar, gondola, or flat car as they are an easier introduction than a caboose. There are also many posts on this blog that offer resin kit building tips and techniques. At the bottom of the page is a list of categories used to classify the posts. Click on Resin Freight Cars and several construction oriented posts should appear to read. Good luck! – Eric H.
Very nice looking models Jim. 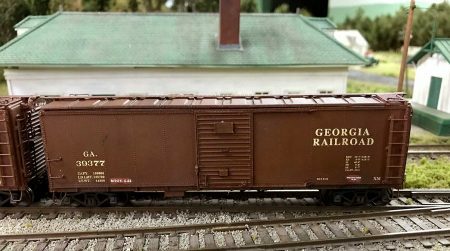 Jim, Nice job on this pair of Georgia Railroad cars. I like the attention to detail like the extended right stile and rivets.